If you resolved to be healthier and more active in the new year, there are plenty of things you can do besides hit the gym. In Alabama, winter is a great time to hike because you can avoid the extreme heat and also avoid the crowds. Plus, the leaves will have fallen from the hardwood trees, revealing fantastic views of the forest that you can’t get during the lush summer. So, what are you waiting for? Put on an extra layer, lace up the books, and experience a different side of Alabama the Beautiful with these 10 fantastic winter hikes. This 4.2-mile loop near Martin Dam in Tallapoosa is the newest trail built by the Cherokee Ridge Alpine Trail Association (CRATA). From the trailhead for the John B. Scott Forever Wild Trail, you’ll follow the banks of the wide Tallapoosa River where you may spy bald eagles soaring above. The trail then ducks into a mixed forest of mountain laurel, bigleaf magnolia, and dogwoods. As you continue, you’ll zig-zag across a sparkling creek that tumbles down to create several small cascades and shoals. With a light dusting of snow, the path is still and peaceful. The trail culminates with a spectacular view of the region’s hills and valleys from the boulder-strewn summit of Saddle Rock Mountain. Use caution at the edge of the bluffs not only when there is ice but any time of the year. Magnificent rock shelters, sandstone bluffs, and an incredible view of the mountains that surround the city of Huntsville await you on 8.5 miles of trails at Blevins Gap Preserve. The Land Trust of North Alabama manages the preserve, which includes a wide variety of trails ranging from easy to difficult. Highlights include expansive views from the east and west sides of a ridge along the Bill and Marion Certain Trail and the West Bluff Trail. Along the Varnedoe Trail, you’ll encounter impressive rock shelters, and you can descend the ridge to take a break from the chilly winter breezes and follow the Smoke Rise Trail, which is believed to have been part of the Trail of Tears. The Land Trust asks that you do not hike the trails for a few days after it rains or after a hard freeze, because you might damage the trails. Also be aware that one of the main trailheads on Cecil Ashburn Drive will be closed until May 2020 due to a road closure. On the Land Trust website, you’ll find directions for alternate trail access points. The Monte Sano Nature Preserve is one of the most popular preserves in north Alabama, offering more than 23 miles of interconnected trails. It’s a great destination for winter hiking, with paths that loop around rock bluffs with waterfalls that sometimes freeze to form curtains of icicles. If streams and waterfalls aren’t frozen, this is still an attractive place to hike. Because Alabama usually receives plenty of rain in winter, you can often find tumbling streams on the western side of the preserve where the Alms House, Fagan Springs, and Wildflower trails visit lively creeks. If you prefer to run trails rather than hike, try the Bluff Line Trail, which has little elevation change as it runs through an attractive hardwood forest, but still challenges runners with creek crossings and rocky terrain. Hikers say McDill Point boasts the most impressive view in the entire Talladega National Forest, and it’s even more spectacular in winter when snow or frost covers the treetops. Find out for yourself with a moderate hike that combines the famous Pinhoti Trail and Cave Creek Trail to form a 6.7-mile loop. The hike begins at the Cheaha Mountain Trailhead located just below the summit of the state’s tallest mountain. From there. You’ll traverse rocky ridges and pass the granite and bronze marker that celebrates the connection of the Pinhoti Trail and the Appalachian Trail. Then, you’ll continue climbing to that breathtaking view from McDill Point. If you’re looking for a quiet winter walk, head up to Pinson, Alabama, and hit the trails at the Turkey Creek Nature Preserve. The park’s Thompson Trace and Hanby Hollow trails connect to create a nice 2.3-mile moderate loop to follows a rocky bluff atop a ridge and then descends to the swift waters of Turkey Creek. On a sunny winter day, this is the perfect spot to relax and enjoy a bit of warmth from the sun. For a more strenuous hike, try the 3.2-mile Narrows Ridge loop, which has some steep sections as it passes rocky cliffs and traverses a ridge where ledges offer great views during winter. Just stay alert, as this trail is also popular with mountain bikers. All three trails can be accessed from the same trailhead along the park road. 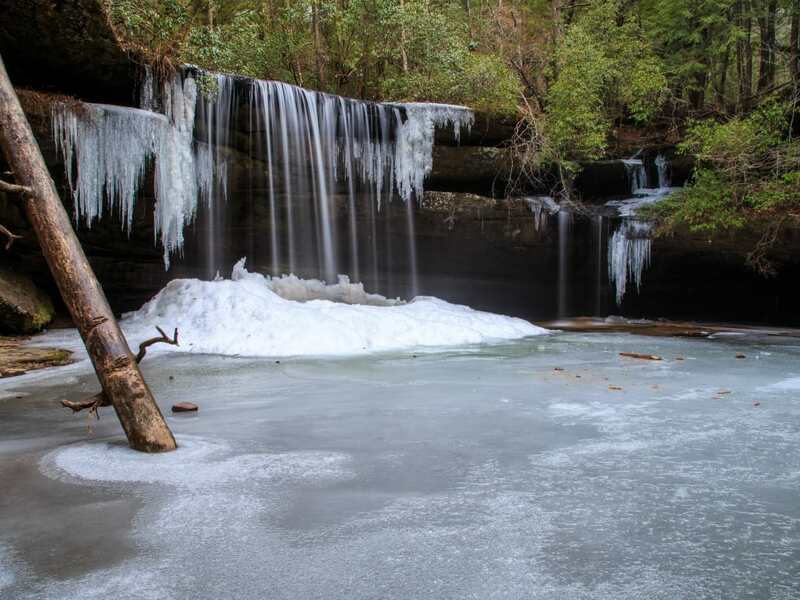 Winter in the Bankhead National Forest is truly amazing, as the rains bring life to hundreds of waterfalls, creeks, and streams. This winter, take an easy 2-mile out-and-back to visit the most photographed waterfall in Alabama, Caney Creek Falls. In winter, the wide curtain of falling water is framed with sheets of glistening ice. Begin the hike at the Caney Creek Trailhead, a very narrow pull-off with limited space for parking. Please use caution on the final descent down to the falls, because the rocks can be very slippery. If the bare winter woods have you jonesing for some greenery, the Sipsey Wilderness is the perfect destination. While it’s situated in northern Alabama, the forest resembles the high-elevation terrain of north Georgia, with stands of rhododendron and mountain laurel whose leaves remain a deep-green color year-round. Take your pick of trails atop the state’s highest mountain at Cheaha State Park for spectacular winter views. If it’s freezing outside, and you’re looking for a short walk, you have a couple of great options. One of the best is Pulpit Rock, a 1.1-mile out-and-back hike that takes you to a quartzite outcrop where you can gaze over a vast expanse of the Talladega National Forest. Another easy hike with a big payoff is the Doug Ghee Accessible Trail, which is ADA accessible and follows an elevated boardwalk. During this 1.1-mile out-and-back hike you’ll pass through a mature forest of oak, hickory, and pine to reach Bald Rock, where an observation platform provides a 180-degree view of the surrounding forest. Many people consider this one of the best mountain views in the state, and you can reach it by following the boardwalk or by walking a dirt path that parallels the walkway. When you’re done, warm up with a hot meal and cup of coffee at the Cliffside Restaurant or cozy up for the night in one of the park’s rustic cabins. It’s hard to believe that a beautiful oasis-like Moss Rock Nature Preserve can be found in the middle of an upscale subdivision. Sitting in the heart of Hoover, the 250-acre preserve has 12 miles of trails that explore a wonderland of boulder fields and water features. Winter is the perfect time to experience the preserve when seasonal rains fill Hurricane Creek and ignite several impressive waterfalls. You can experience many of the preserve’s water features on the 1.5-mile Waterfall Loop, a moderate hike that visits Hurricane Creek, a series of falls, and a rare sandstone glade. DeSoto State Park is an amazing place any time of year, but winter may be its most impressive season. As a light dusting of snow covers the ground and ice builds up along the sides of the park’s many waterfalls, hikers enjoy winter hiking at its best. There are two hikes in the park that you really should experience in winter. 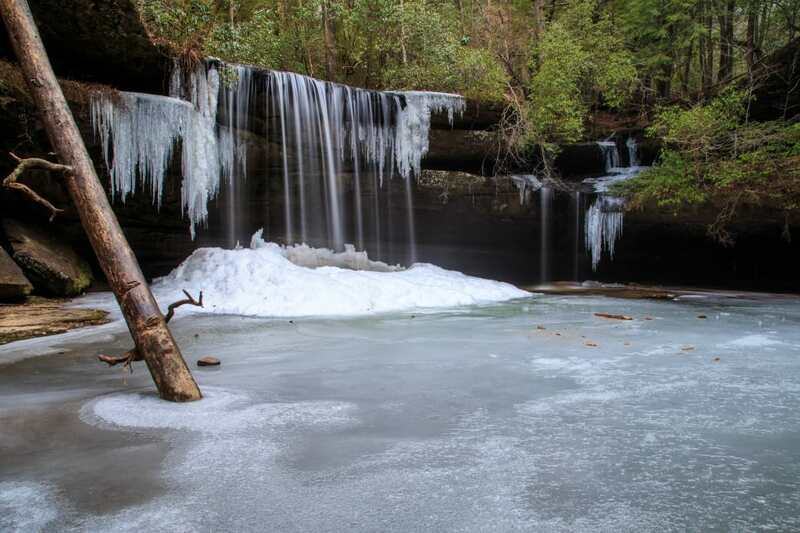 The first is the easy to moderate 2.3-mile Falls Loop that takes you past not one but three waterfalls and cascades that are sometimes adorned with spectacular ice formations. A section of the longer DeSoto Scout Trail will take you high above the raging turquoise waters of the West Fork of Little River, and then lead you down to the banks of the river itself. Combine this with the Cabin Trail for a nice 3.1-mile loop that also includes impressive views from below and above 20-foot-high Indian Falls and 25-foot-high Lodge Falls. Whether it’s topped with snow or there’s just a chill in the air, you’re in for a treat on the trails at Flagg Mountain in Weogufka State Forest. The mountain is experiencing a revival with new campsites near the summit and recently renovated rustic cabins where you can warm up after a day of hiking. Up to 5 miles of looping trails interconnect to take you to the banks of the flowing Weogufka Creek and to inspiring views from the top of the mountain. Flagg is now the southern terminus of the Pinhoti Trail, which stretches more than 330 miles, so this is an excellent destination for those seeking a challenging winter hike that extends for days or even weeks.